This page is a translated version of the page Ercolessi and the translation is 100% complete. The E. E. Ercolessi brand comes from the commercial activities of Edgardo Ercolessi and his wife Elvira, who in 1921 founded a writing materials resale activity with two major shops in the central streets of Milan. 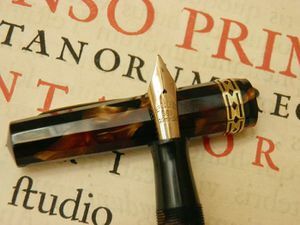 So it is not strictly a fountain pens manufacturer, and would therefore not be correct count him among the producers, but since this brand has been used to cover a very wide production, performed by leading Italian manufacturers, it was considered appropriate to treat it explicitly. It seems that Edgardo Ercolessi was linked by kinship with Eugenio Verga, founder of Columbus and friendly relations with Armando Simoni founder of Omas. Thanks to his knowledge he was able to successfully address the writing instruments market and his company expanded with several stores in Milan, up to the central Corso Vittorio Emanuele. In his activities Edgardo Ercolessi began to propose in its stores pens explicitly marked with his name. It is unclear whether the origin of this production have been promotional needs or the need to stand out on the market, but in the long the company gave birth to productions with its brand. The first branded pens Ercolessi, built in the early '20s, were hard rubber safety pens, in the Waterman 42 style, almost certainly produced by Columbus. To these were added later lever filler models. To these followed Duofold style pensin in colored celluloid, presumably produced, as most of the Ercolessi branded pens of the '30s, by Omas. These followed then other models, referred to as Series 50, button filler derived from the Minerva Ellittica and produced with the same measures, adopting the same numbering copying the pattern used by Waterman: the 52½ V (short and thin, like a lady, ring), the 52½ (mean and thin), the 52 (medium) and 55 (large). The pens had however, contrasting the original, is decorated with three rings and different colors of celluloid. This line was joined by a more refined line, derived from the lever filler Minerva Ellittica, also produced this with unusual colors for the original version. As further evidence of a production left largely to Omas there were also some Ercolessi pens derived from the Minerva Classica, both in the lever filler and piston filler versions, also distinct from the different celluloid colors and the presence of three rings on the cap. Celluloid pens were joined also by safety versions decorated with elaborate metal overlays, again named after the Waterman pattern with the numbers 42 , 42½ and 42½ V, that were probably made by Columbus. Alsa the model called Velox was Columbus production, similar to the round Columbus Extra models, with wheel clip and two rings of different thickness on the cap. Since the '40s collaboration with Omas and Columbus ceased, probably because of the difficulties in the supply of celluloid. Then the Ercolessi turned to Ancora, which produced for the company piston filler models called Ercolessi 62 and Ercolessi 65, derived from the Lusso economic versions. During the war and post-war the economic difficulties narrowed sales of luxury goods, and even the Ercolessi fell into line with the production of cheaper models, commissioned in this case to Montegrappa and Radius, in particular the latter produced the so-called Series 70, a derivative of the streamlined Radius Extra. In the following years, with the crisis of the fountain and the market entry of the disposable ballpoint pens, Ercolessi completely ceased the production of fountain pens under its own brand, remaining active only in business with stores Milan, which even today are a reference point for fountain pens fans in that city. This page was last edited on 17 June 2017, at 18:33.